Almost all heavy industries world-wide use gear drives to reduce the high shaft speed of a prime mover to a usable R.P.M. American's large bore and close-tolerance roller bearings are installed in many large, heavy-duty gearing arrangements. Huge gears are necessary to turn the large shafts, that do everything from flattening out metals in the rolling mills to moving the launch crawler for the space shuttle. 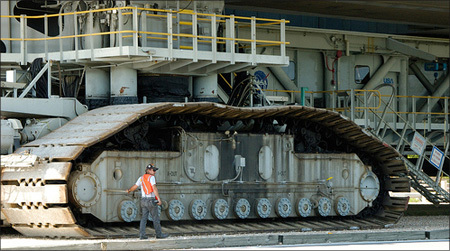 Special American Cylindrical Roller Bearings are used in the NASA "crawler" shuttle transporter.